This article is about electrical recharging. For pneumatic recharging, see compressed-air vehicle. "Charge point" redirects here. For the company, see ChargePoint. Top-left: a Tesla Roadster (2008) being charged at an electric charging station in Iwata city, Japan. Top-right: Nissan Leaf recharging from a NRG Energy eVgo station in Houston, Texas. Bottom-left: converted Toyota Priuses recharging at public charging stations in San Francisco (2009). Bottom-right: Brammo Empulse electric motorcycle at an AeroVironment charging station. An electric vehicle charging station, also called EV charging station, electric recharging point, charging point, charge point, ECS (electronic charging station), and EVSE (electric vehicle supply equipment), is an element in an infrastructure that supplies electric energy for the recharging of plug-in electric vehicles—including electric cars, neighborhood electric vehicles and plug-in hybrids. For charging at home or work, some EVs have onboard converters that can plug into a standard electrical outlet or a high-capacity appliance outlet. Others either require or can use a charging station that provides electrical conversion, monitoring, or safety functionality. These stations are also needed when traveling, and many support faster charging at higher voltages and currents than are available from residential EVSEs. Public charging stations are typically on-street facilities provided by electric utility companies or located at retail shopping centers, restaurants and parking places, operated by a range of private companies. Charging stations provide a range of heavy duty or special connectors that conform to the variety of standards. For common rapid charging and DC, the Combined Charging System (CCS) is becoming the universal standard. Others are CHAdeMO, and the Type 2 connector. Residential charging stations: An EV owner plugs in when he or she returns home, and the car recharges overnight. A home charging station usually has no user authentication, no metering, and may require wiring a dedicated circuit. Some portable chargers can also be wall mounted as charging stations. Charging while parked (including public charging stations) – a commercial venture for a fee or free, offered in partnership with the owners of the parking lot. This charging may be slow or high speed and encourages EV owners to recharge their cars while they take advantage of nearby facilities. It can include parking stations, parking at malls, small centers, and train stations (or for a business's own employees). Fast charging at public charging stations >40 kW, delivering over 60 miles (100 km) of range in 10–30 minutes. These chargers may be at rest stops to allow for longer distance trips. They may also be used regularly by commuters in metropolitan areas, and for charging while parked for shorter or longer periods. Common examples are Type 2, CCS, CHAdeMO (a company that designs and sells standardized chargers), SAE Combined Charging System, and Tesla Superchargers. Battery swaps or charges in under 15 minutes. 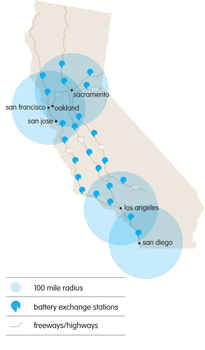 A specified target for CARB credits for a zero-emission vehicle is adding 200 miles (approx. 320 km) to its range in under 15 minutes. In 2014, this was not possible for charging electric vehicles, but it is achievable with EV battery swaps. It intends to match the refueling expectations of regular drivers and give crane mobile support for discharged vehicles where there is no charging station. Battery capacity and the capability of handling faster charging are both increasing, and methods of charging have needed to change and improve. New options have also been introduced (on a small scale, including mobile charging stations and charging via inductive charging mats). The differing needs and solutions of various manufacturers has slowed the emergence of standard charging methods, and in 2015, there is a strong recognition of the need for standardization. The US based SAE defines Level 1 charging as using a standard 120 volt AC house outlet to charge an electric vehicle. This will take a long time to fully charge the car but if only used to commute or travel short distances, a full charge is not needed or can be done overnight. 240 volt AC charging is known as Level 2 charging. Level 2 charging is similar to household appliances such as clothes driers. Level 2 chargers range from chargers installed in consumer garages, to relatively slow public chargers. They can charge an electric car battery in 4–6 hours. Level 2 chargers are often placed at destinations so that drivers can charge their car while at work or shopping. Level 2 home chargers are best for drivers who use their vehicles more often or require more flexibility. In many countries outside of North and South America, this is the standard household voltage. "AC Level 3" charging was defined in early editions of SAE J1772 at up to 400 amps, but has been dropped. Edition 7 of J1772 (2017) states in Appendix M "AC Level 3 charging has never been implemented. The following is historical information for reference only." The term "Level 3" appears to have been adopted colloquially to mean DC "fast" charging, although "Level 3" was never defined to mean that in J1772. Table 17 in Appendix M of J1772 (2017) lists AC Level 2 and AC Level 3 from 208 to 240 VAC, and DC Charging with 208-600 V input and 0–1000 V DC output. DC charging generally supports charging up to 500 volts for passenger cars. Some newer high-end passenger car EVs and many heavy duty EV trucks and buses use DC charging with a nominal DC voltage of 700 V or higher, but below 1000 V peak. The organization CHAdeMO is working to standardize fast chargers. DC chargers in North America often use a 480 VAC input delivering 62.5 kW (peak power can be as much as 120 kW and is varied across the charge. 208 VAC inputs to the charger are also used, and 400 VAC is standard in Europe. The Tesla Supercharger is the most ubiquitous in the United States.[when?] For a Tesla Model S 75, a supercharger can add around 275 km (170 miles) of range in about 30 minutes or a full charge in around 75 minutes. As of April 2018, Tesla reports that they have 1,210 supercharging stations and is continuously expanding the network. Another standards organization, The International Electrotechnical Commission, defines charging in modes (IEC 62196). Case A is any charger connected to the mains (the mains supply cable is usually attached to the charger) usually associated with modes 1 or 2. Case B is an on-board vehicle charger with a mains supply cable which can be detached from both the supply and the vehicle – usually mode 3. Case C is a dedicated charging station with DC supply to the vehicle. The mains supply cable may be permanently attached to the charge-station such as in mode 4. For Combined Charging System (CCS) DC charging which requires PLC (Powerline Communications), two extra connectors are added at the bottom of Type 1 or Type 2 vehicle inlets and charging plugs to connect high voltage DC charging stations to the battery of the vehicle. These are commonly known as Combo 1 or Combo 2 connectors. The choice of Combo 1 or Combo 2 style inlets is normally standardised on a per-country basis, so that public charging providers do not need to fit cables with both variants. Generally, North America uses Combo 1 style vehicle inlets, most of the rest of the world uses Combo 2 style vehicle inlets for CCS. Fast charging, however and whenever it gets built out, is going to be key for the development of a mainstream market for plug-in electric vehicles. The broader conflict between the CHAdeMO and SAE Combo connectors, we see that as a hindrance to the market over the next several years that needs to be worked out. As of September 16, 2013, a standard does not exist in Australia for charging connectors. Australia’s first fast-DC charging stations follow the Japanese CHAdeMO standard. In the United States, the standard charging station sign is defined in the Federal Highway Administration's Manual on Uniform Traffic Control Devices (MUTCD) 2009 edition. In July 2013, FHWA released interim MUTCD approval for charging station signs located on public roads governed by MUTCD standards. There is an open source, public domain European charge station sign proposed. The vehicle is connected to the power grid through standard socket-outlets present in residences, which depending on the country are usually rated at around 10 A. To use mode 1, the electrical installation must comply with the safety regulations and must have an earthing system, a circuit breaker to protect against overload and an earth leakage protection. The sockets have blanking devices to prevent accidental contacts. Heating of the socket and cables following intensive use for several hours at or near the maximum power (which varies from 8 to 20 A depending on the country). Fire or electric injury risks if the electrical installation is obsolete or if certain protective devices are absent. The second limitation is related to the installation's power management. As the charging socket shares a feeder from the switchboard with other sockets (no dedicated circuit) if the sum of consumptions exceeds the protection limit (in general 16 A), the circuit-breaker will trip, stopping the charging. The vehicle is connected to the main power grid via household socket-outlets. Charging is done via a single-phase or three-phase network and installation of an earthing cable. A protection device is built into the cable. This solution is more expensive than Mode 1 due to the specificity of the cable. The vehicle is connected directly to the electrical network via specific socket and plug and a dedicated circuit. A control and protection function is also installed permanently in the installation. This is the only charging mode that meets the applicable standards regulating electrical installations.[which?] It also allows load shedding so that electrical household appliances can be operated during vehicle charging or on the contrary optimise the electric vehicle charging time. 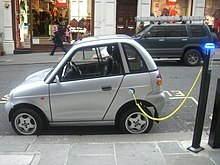 The electric vehicle is connected to the main power grid through an external charger. Control and protection functions and the vehicle charging cable are installed permanently in the installation. Prototype modified Renault Laguna E.V. cars charging at Project Better Place charging stations in Ramat Hasharon, Israel, north of Tel Aviv. Public charging stations in a parking lot near Los Angeles International Airport. Shown are two old/obsolete (6 kW level-2) EVSE units (left: inductive Magne-charge gen2 SPI, right: conductive EVII ICS-200 AVCON). Charging stations for electric vehicles may not need much new infrastructure in developed countries, less than delivering a new alternative fuel over a new network. The stations can leverage the existing ubiquitous electrical grid and home recharging is an option, since most driving is local over short distances which reduces the need for charging mid-trip. For example, in the United States, 78% of commutes are less than 40 miles (64 km) round-trip. Nevertheless, longer drives between cities and towns require a network of public charging stations or another method to extend the range of electric vehicles beyond the normal daily commute. One challenge in such infrastructure is the level of demand: an isolated station along a busy highway may see hundreds of customers per hour if every passing electric vehicle has to stop there to complete the trip. In the first half of the 20th century, internal combustion vehicles faced a similar infrastructure problem. The usable battery capacity of a first-generation electric vehicle, such as the original Nissan Leaf, is about 20 kWh, giving it a range of about 100 mi (160 km). Tesla was the first company to introduce longer range mass production electric vehicles, initially releasing their Model S with battery capacities of 40 kWh, 60 kWh and 85 kWh, with the latter having an estimated range of approximately 480 km (300 mi). Plug in hybrid vehicles have capacity of roughly 3 to 5 kWh, for an electrical range of 20 to 40 kilometers, but the gasoline engine ensures the full range of a conventional vehicle. Use the vehicle's built-in charger, designed to charge from 3 to 43 kW at 230 V single-phase or 400 V three-phase. Use an external charger, which converts AC current into DC current and charges the vehicle at 50 kW (e.g. Nissan Leaf) or more (e.g. 120-135 kW Tesla Model S). The user finds charging an electric vehicle as simple as connecting a normal electrical appliance; however to ensure that this operation takes place in complete safety, the charging system must perform several safety functions and dialogue with the vehicle during connection and charging. The cost to set up Electric vehicle charging infrastructure has declined substantially over the past 5 years due to growth in volumes. As of 2018, the installation of Level 2 charger costs approximately $6,000-$10,000 whereas fast chargers cost almost 7-8 times. Tesla currently gives the owners of its Model S and Model X cars a supercharging credit that gives 400 kWh for free. After that credit is used, drivers using Tesla Superchargers have to pay per kWh. The price ranges from $0.06 to $0.26 per kWh in the United States. Tesla superchargers are only usable by Tesla vehicles. Other charging networks are available for non-Tesla vehicles. The Blink network of chargers has both Level 2 and DC Fast Chargers and charges separate rates for members and non members. Their prices range from $0.39 to $0.69 per kWh for members and $0.49 to $0.79 per kWh for non members, depending on location. The ChargePoint network has free chargers and paid chargers that drivers activate with a free membership card. The paid charging stations' prices are based on local rates (similarly to Blink). Other networks use similar payment methods as typical gas stations, in which one pays with cash or a credit card per kWh of electricity. Although the rechargeable electric vehicles and equipment can be recharged from a domestic wall socket, a charging station is usually accessible to multiple electric vehicles and has additional current or connection sensing mechanisms to disconnect the power when the EV is not charging. Current sensors which monitor the power consumed, and maintain the connection only if the demand is within a predetermined range. Sensor wires react more quickly, have fewer parts to fail and are possibly less expensive to design and implement. Current sensors however can use standard connectors and can readily provide an option for suppliers to monitor or charge for the electricity actually consumed. Additional physical "sensor wires" which provide a feedback signal such as specified by the undermentioned SAE J1772 and IEC 62196 schemes that require special (multi-pin) power plug fittings. Until 2013, there was an issue where Blink chargers were overheating and causing damage to both charger and car. The solution employed by the company was to reduce the maximum current. Currently charging stations are being installed by public authorities, commercial enterprises and some major employers in order to stimulate the market for vehicles that use alternative fuels to gasoline and diesel fuels. For this reason, most charge stations are currently either provided gratis or accessible to members of certain groups without significant charge (e.g. activated by a free "membership card" or by a digital "day code"). As of December 2012[update], around 50,000 non-residential charging points were deployed in the U.S., Europe, Japan and China. As of August 2014[update], there are 3,869 CHAdeMO quick chargers deployed around the world, with 1,978 in Japan, 1,181 in Europe and 686 in the United States, 24 in other countries. As of December 2013[update], Estonia is the first and only country that had completed the deployment of an EV charging network with nationwide coverage, with 165 fast chargers available along highways at a maximum distance of between 40 to 60 km (25 to 37 mi), and a higher density in urban areas. As of August 2018[update], there were 800,000 electric vehicles and 18,000 charging stations in the United States. As of March 2013[update], 5,678 public charging stations existed across the United States, with 16,256 public charging points, of which 3,990 were located in California, 1,417 in Texas, and 1,141 in Washington. As of November 2012[update], about 15,000 charging stations had been installed in Europe. As of March 2013[update], Norway, which has the highest electric ownership per capita, had 4,029 charging points and 127 quick charging stations. As part of its commitment to environmental sustainability, the Dutch government initiated a plan to establish over 200 fast (DC) charging stations across the country by 2015. 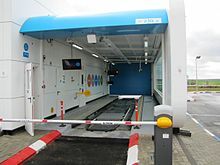 The rollout will be undertaken by Switzerland-based power and automation company ABB and Dutch startup Fastned, and will aim to provide at least one station every 50 kilometres (31 miles) for the Netherlands' 16 million residents. In addition to that, the E-laad foundation installed about 3000 public (slow) charge points since 2009. As of December 2012[update], Japan had 1,381 public quick-charge stations, the largest deployment of fast chargers in the world, but only around 300 slow chargers. As of December 2012[update], China had around 800 public slow charging points, and no fast charging stations. As of December 2012[update], the country with the highest ratio of quick chargers to electric vehicles (EVSE/EV) was Japan, with a ratio of 0.030, and the Netherlands had the largest ratio of slow EVSE/EV, with more than 0.50, while the U.S had a slow EVSE/EV ratio of 0.20. As of September 2013[update], the largest public charging networks in Australia exist in the capital cities of Perth and Melbourne, with around 30 stations (7 kW AC) established in both cities – smaller networks exist in other capital cities. In April 2017, YPF, the state-owned oil company of Argentina, reported that it will install 220 fast-load stations for electric vehicles in 110 of its service stations in national territory. Charging stations can be found and will be needed where there is on-street parking, at taxi stands, in parking lots (at places of employment, hotels, airports, shopping centers, convenience shops, fast food restaurants, coffeehouses etc. ), as well as in the workplaces, in driveways and garages at home. Existing filling stations may also incorporate charging stations. As of 2017[update], charging stations have been criticized for being inaccessible, hard to find, out of order, and slow; thus reducing EV expansion. At the same time more gas stations add EV charging stations to meet the increasing demand among EV drivers. Worldwide, hotels are adopting a policy of providing their guests with electric car charging. The EV Hotels App for iPhones and iPads is available to discover this growing number of hotels. Electric car manufacturers, charging infrastructure providers, and regional governments have entered into many agreements and ventures to promote and provide electric vehicle networks of public charging stations. There is a clear co-relation between EV sales and charging infrastructure in every part of the world. And, the stakeholders most likely affected by this co-relation are the car manufacturers themselves. Furthermore, investment by OEMs also bolsters consumer trust in this new technology. Taking cognizance of this fact, Ford, BMW, Daimler, and Volkswagen Group are collaborating to construct a network of ultra-fast charging stations across EU. The EV Plug Alliance is an association of 21 European manufacturers which proposes an alternative connecting solution. The project is to impose an IEC norm and to adopt a European standard for the connection solution with sockets and plugs for electric vehicle charging infrastructure. Members (Schneider Electric, Legrand, Scame, Nexans, etc.) argue that the system is safer because they use shutters. General consensus is that the IEC 62196 and IEC 61851-1 already have taken care of safety by making parts non-live when touchable. An operator manages charging stations from one or more manufacturers. In colder areas such as Finland, some northern US states and Canada there already exists some infrastructure for public power outlets provided primarily for use by block heaters and set with circuit breakers that prevent large current draws for other uses. These can sometimes be used to recharge electric vehicles, albeit slowly. In public lots, some such outlets are turned on only when the temperature falls below -20 °C, further limiting their use. A battery swapping (or switching) station is a place at which a vehicle's discharged battery or battery pack can be immediately swapped for a fully charged one, eliminating the delay involved in waiting for the vehicle's battery to charge. Battery swapping is common in warehouses using electric forklift trucks. The concept of an exchangeable battery service was first proposed as early as 1896, in order to overcome the limited operating range of electric cars and trucks. It was first put into practice between 1910 and 1924, by Hartford Electric Light Company, through the GeVeCo battery service, and was initially available for electric trucks. The vehicle owner purchased the vehicle, without a battery, from General Vehicle Company (GeVeCo), part-owned by General Electric, and the electricity was purchased from Hartford Electric through the use of an exchangeable battery. Both vehicles and batteries were modified to facilitate a fast battery exchange. The owner paid a variable per-mile charge and a monthly service fee to cover maintenance and storage of the truck. During the period of the service, the vehicles covered more than 6 million miles. Beginning in 1917, a similar successful service was operated in Chicago for owners of Milburn Electric cars, who also could buy the vehicle without the batteries. A rapid battery replacement system was implemented to keep running 50 electric buses at the 2008 Summer Olympics. In recent years, Better Place, Tesla, and Mitsubishi Heavy Industries have been involved with integrating battery switch technology with their electric vehicles to extend driving range. In a battery switch station, the driver does not need to get out of the car while the battery is swapped. Battery swap requires an electric car designed for the "easy swap" of batteries. However, electric vehicle manufacturers working on battery switch technology have not standardized on battery access, attachment, dimension, location, or type. In 2013, Tesla announced a proprietary charging station service to support owners of Tesla vehicles. A network of Tesla Supercharger stations was supposed to support both battery pack swaps for the Model S, along with the more-widespread fast charging capability for both the Model S and the Tesla Roadster. However, Tesla has abandoned their battery swap initiatives in favor of rapidly expanding fast-charging stations. This decision has driven Tesla to be a market-leader in fast charging stations, amounting to 1,210 stations worldwide, as of April 2018. Fast battery swapping under five minutes. Unlimited driving range where there are battery switch stations available. The driver does not have to get out of the car while the battery is swapped. The driver does not own the battery in the car, transferring costs over the battery, battery life, maintenance, capital cost, quality, technology, and warranty to the battery switch station company. Contract with battery switch company could subsidize the electric vehicle at a price lower than equivalent petrol cars. The spare batteries at swap stations could participate in vehicle to grid storage. 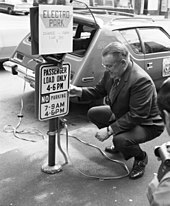 The Better Place network was the first modern commercial deployment of the battery switching model. The Renault Fluence Z.E. was the first electric car enabled with switchable battery technology available for the Better Place network in operation in Israel and Denmark. Better Place used the same technology to swap batteries that F-16 jet fighter aircraft use to load their bombs. Better Place launched its first battery-swapping station in Israel, in Kiryat Ekron, near Rehovot in March 2011. The battery exchange process took five minutes. As of December 2012[update], about 600 Fluence Z.E.s had been sold in the country. Sales during the first quarter of 2013 improved, with 297 cars sold, bringing the total fleet in Israel close to 900. As of December 2012[update], there were 17 battery switch stations fully operational in Denmark, enabling customers to drive anywhere across the country in an electric car. Fluence Z.E. sales totaled 198 units through December 2012. Better Place filed for bankruptcy in Israel in May 2013. The company's financial difficulties were caused by the high investment required to develop the charging and swapping infrastructure, about US$850 million in private capital, and a market penetration significantly lower than originally predicted by Shai Agassi. Fewer than 1,000 Fluence Z.E. cars had been deployed in Israel and only around 400 units in Denmark. Under Better Place's business model, the company owned the batteries, so the court liquidator had to decide what to do with customers who did not have ownership of the battery and risked being left with a useless car. Tesla Supercharger network rapid charging station in Tejon Ranch, California. The rooftop of the carport has a solar collector manufactured by SolarCity feeding energy into the grid. Tesla designed its Model S to allow fast battery swapping. In June 2013, Tesla announced its goal of deploying a battery swapping station in each of its supercharging stations. At a demonstration event, Tesla showed that a battery swap operation with the Model S took just over 90 seconds, about half the time it takes to refill a gasoline-powered car used for comparison purposes during the event. The first stations were planned to be deployed along Interstate 5 in California because, according to Tesla, a large number of Model S sedans make the San Francisco-Los Angeles trip regularly. Those stations were to be followed by ones on the Washington, DC to Boston corridor. Elon Musk said the service would be offered for the price of about 15 US gallons (57 l; 12 imp gal) of gasoline at the current local rate, around US$60 to US$80 at June 2013 prices. Owners could pick up their battery pack fully charged on the return trip, which was included in the swap fee. Tesla would also offer the option to keep the pack received on the swap and pay the price difference if the battery received was newer, or to receive the original pack back from Tesla for a transport fee. Pricing had not been determined. In June 2015, Musk indicated that Tesla was likely to abandon its plans to build a network of swap stations. He told his company's shareholders that, despite inviting all Model S owners in the California area to try out the one existing facility, at Harris Ranch, only four or five people had done so. Consequently, it was unlikely that the concept was worth expanding. Gogoro has announced their intention to launch the Gogoro Energy Network in 2015. The network is built on the idea of distributed GoStations which will serve as battery swapping locations for Gogoro's Smartscooters. BattSwap is a new European start-up with battery swap solution. It has a working prototype covered by seed funding received from European angels. Swap station takes only 30 seconds to make a complete swap and is 10x cheaper than Tesla supercharger to build. Voltia (formerly Greenway Operator) designed and runs proprietary battery swapping stations (BSS) in Slovakia for switching the batteries in light commercial vehicles. The stations have been in successful commercial operation since 2012. Voltia's BSS are drive up/drive in station, with a house for a number of batteries to be charged simultaneously. The structure allows drivers to pull up and, using a hydraulic lift, switch their used battery with a new, fully charged one in under 7 minutes. A computer system notifies drivers where to dock their old battery and which new one to take. It is ideal for companies for whom time is of the essence and time spent recharging is time and money. The batteries come in a variety of sizes (40-90kWh), which offer different useful ranges (160–270 km). These battery swapping solution have been criticized for being proprietary. By creating a monopoly regarding the ownership of the batteries and the patent protected technologies the companies split up the market and decrease the chances of a wider usage of battery swapping. Recharging a large battery pack presents a high load on the electrical grid, but this can be scheduled for periods of reduced load or reduced electricity costs. In order to schedule the recharging, either the charging station or the vehicle can communicate with the smart grid. Some plug-in vehicles allow the vehicle operator to control recharging through a web interface or smartphone app. Furthermore, in a vehicle-to-grid scenario the vehicle battery can supply energy to the grid at periods of peak demand. This requires additional communication between the grid, charging station, and vehicle electronics. SAE International is developing a range of standards for energy transfer to and from the grid including SAE J2847/1 "Communication between Plug-in Vehicles and the Utility Grid". ISO and IEC are also developing a similar series of standards known as ISO/IEC 15118: "Road vehicles -- Vehicle to grid communication interface". Several Chevrolet Volts at a charging station powered with solar panels in Frankfort, Illinois. The SPARC (Solar Powered Automotive ReCharging Station) uses a single custom fabricated monocrystalline solar panel capable of producing 2.7 kW of peak power to charge pure electric or plug-in hybrid to 80% capacity without drawing electricity from the local grid. Plans for the SPARC include a non-grid tied system as well as redundancy for tying to the grid through a renewable power plan. This supports their claim for net-zero driving of electric vehicles. The E-Move Charging Station is equipped with eight monocrystalline solar panels, which can supply 1.76 kWp of solar power. With further refinements, the designers are hoping to generate about 2000 kWh of electricity from the panels over the year. In 2012, Urban Green Energy introduced the world's first wind-powered electric vehicle charging station, the Sanya SkyPump. The design features a 4 kW vertical-axis wind turbine paired with a GE WattStation. ^ "A Simple Guide to DC Fast Charging". Fleetcarma.com. Retrieved 2017-10-05. ^ a b "Understanding Electric Vehicle Charging – Plug In America". Plug In America. 2011-01-31. Retrieved 2017-11-29. ^ Administrator. "Levels of Charging – EVTown". www.evtown.org. Retrieved 2017-11-29. ^ "What is Fast Charging – Chademo Association". www.chademo.com. Retrieved 2017-11-29. ^ "Supercharger | Tesla". www.tesla.com. Retrieved 2017-11-29. ^ John Upton (2013-07-26). "EV market threatened by spat over charger standards". Grist.org. Grist Magazine, Inc. Retrieved 2013-07-29. ^ a b Juliet Pyper (2013-07-24). "Charger standards fight confuses electric vehicle buyers, puts car company investments at risk". ClimateWire. E&E Publishing, LL. Retrieved 2013-07-29. ^ a b Thomas Bräunl (2013-09-16). "Setting the standard: Australia must choose an electric car charging norm". The Conversation Australia. Retrieved 2013-09-16. ^ "MUTCD – Regulatory Signs for Electric Vehicle Charging and Parking Facilities Memorandum – FHWA MUTCD". mutcd.fhwa.dot.gov. Retrieved 2015-06-02. ^ "Plug-In 2008: Company News: GM/V2Green/Coulomb/Google/HEVT/PlugInSupply". CalCars. 2008-07-28. Retrieved 2010-05-30. ^ "Guide to buy the right EV home charging station". US: Home Charging Stations. 2018-01-03. Retrieved 2018-09-01. ^ "Global EV Fast Charger Market 2018-2025". Mobility Foresights. Retrieved 2019-04-09. ^ "Supercharger | Tesla". www.tesla.com. Retrieved 2017-11-28. ^ "Supercharging". www.tesla.com. Retrieved 2017-11-28. ^ "Electric Vehicle Charging | United States | Blink CarCharging". Electric Vehicle Charging | United States | Blink CarCharging. Retrieved 2017-11-28. ^ "Driver FAQ". ChargePoint. Retrieved 2017-11-29. ^ "Honda Fit EV". PluginCars.com. Retrieved 16 July 2015. ^ "Don't Blink… – A Perfect Fit". A Perfect Fit. Retrieved 16 July 2015. ^ Danny King. "Ecotality trying to fix charging station problems by reducing power". Autoblog. Retrieved 16 July 2015. ^ a b c d International Energy Agency, Clean Energy Ministerial, and Electric Vehicles Initiative (April 2013). "Global EV Outlook 2013 – Understanding the Electric Vehicle Landscape to 2020" (PDF). International Energy Agency. Archived from the original (PDF) on 2013-04-23. Retrieved 2013-04-20. CS1 maint: Multiple names: authors list (link) See pp. 14-15. ^ "CHAdeMO Association". Retrieved 16 July 2015. ^ Adam Palin (2013-11-19). "Infrastructure: Shortage of electric points puts the brake on sales". Financial Times. Retrieved 2013-12-28. ^ KredEx (2013-02-20). "Estonia becomes the first in the world to open a nationwide electric vehicle fast-charging network". Estonian World. Retrieved 2013-12-28. ^ Adam Vaughan (2013-02-20). "Estonia launches national electric car charging network". The Guardian. Retrieved 2013-12-28. ^ "Utilities, states work together to expand EV charging infrastructure - Daily Energy Insider". Daily Energy Insider. 2018-08-13. Retrieved 2018-08-30. ^ U.S. Department of Energy (2013-04-09). "Alternative Fueling Station Counts by State". Alternative Fuels Data Center (AFDC). Retrieved 2013-04-10. The AFDC counts electric charging units or points, or EVSE, as one for each outlet available, and does not include residential electric charging infrastructure. ^ Danny King (2013-04-10). "US public charging stations increase by 9% in first quarter". Autoblog Green. Retrieved 2013-04-10. ^ Renault Press Release (2012-12-17). "Renault delivers first ZOE EV". Green Car Congress. Retrieved 2012-12-17. ^ "Ladepunkter i Norge" [Charge Points in Norway] (in Norwegian). Grønn bil. Archived from the original on 2012-04-26. Retrieved 2013-04-10. ^ Amar Toor (10 July 2013). "Every Dutch citizen will live within 31 miles of an electric vehicle charging station by 2015". The Verge. Vox Media, Inc. Retrieved 11 July 2013. ^ Stichting E-laad (21 January 2014). "Ondersteuning laadinfrastructuur elektrische auto's wordt voortgezet". Retrieved 26 May 2014. ^ El ámbito (25 April 2017). "Repsol back on track on YPF road: now for electric cars". Retrieved 27 April 2017. ^ Shahan, Zachary (22 July 2017). "Tesla Superchargers vs … Ugh". CleanTechnica. Retrieved 23 July 2017. needs to be done to make a charging network or just individual charging stations adequate for EV drivers .. plenty of complaints about such inaccessible charging stations .. it can take what seems like ages to actually find the station because of how invisible it is .. some charging stations are down 50% of the time .. Unless you’re willing to increase your travel time by ~50%, charging at 50 kW on a road trip doesn’t really cut it ..
^ "Want electric vehicles to scale? Add chargers to gas stations". ^ "EVPlug Alliance". Retrieved 16 July 2015. ^ "MENNEKES – Plugs for the world: The solution for Europe: type 2 charging sockets with or without shutter". Retrieved 16 July 2015. ^ "Electric vehicles – About electric vehicles – Charging – suppliers". Public authority announcement. The Mayor of London for the London Assembly and the Greater London Authority, UK. 2009. Archived from the original on 2012-04-05. Retrieved 2011-11-24. ^ Electric Vehicles, Manitoba Hydro, retrieved 2013-04-02, Manitobans' experience with cold weather and plugging in their vehicles will help ease the transition to adopting PEVs. In some circumstances, the existing infrastructure used to power vehicle block heaters in the winter can also be used to provide limited charging for PEVs. However, some existing electrical outlets may not be suitable for PEV charging. Residential outlets can be part of a circuit used to power multiple lights and other electrical devices, and could become overloaded if used to charge a PEV. A dedicated circuit for PEV charging may need to be installed by a licensed electrician in these situations. Also, some commercial parking lot outlets operate in a load restricted or cycled manner and using them may result in your PEV receiving a lower charge than expected or no charge at all. If a parking stall is not specifically designated for PEV use, we recommend that you consult with the parking lot or building manager to ensure it can provide adequate power to your vehicle. ^ Park and Ride Locations, Calgary Transit, 2009-04-16, retrieved 2009-04-25, The plug-ins located in the Park and Ride lots automatically turn on when the outside temperature falls below -20 degrees and turn off and on in increments to save electricity usage. ^ "Industrial electrical vehicle stalwarts head out on the road". Archived from the original on 2011-07-16. Retrieved 2010-10-24. ^ "Trucking's Eclipsed Electric Age". The Lost Annals of Transport. William B. Cassidy. Retrieved 2015-10-26. ^ Kirsch, David A. (2000). The Electric Vehicle and the Burden of History. New Brunswick, New Jersey, and London: Rutgers University Press. pp. 153–162. ISBN 0-8135-2809-7. ^ "BIT Attends the Delivery Ceremony of the 2008 Olympic Games -Alternative Fuel Vehicles". Beijing Institute of Technology. 2008-07-18. Retrieved 2013-06-02. ^ a b Sebastian Blanco (2009-09-27). "REPORT: Tesla Model S was designed with battery swaps in mind". Autoblog Green. Retrieved 2013-06-22. ^ "Mitsubishi working on battery swapping for transit buses, Better Place not involved". ^ "Better Place. Battery switch stations". Archived from the original on 2012-08-14. ^ Siler, Steve (2013-06-21). "Tesla launches battery-swapping service for two-minute recharging". Yahoo Autos. Retrieved 2013-06-23. ^ Green, Catherine (2013-06-21). "Tesla shows off its battery-swapping station: 90 seconds and less than $100". Silicon Valley Mercury News. Retrieved 2013-06-23. ^ "Tesla shuts down battery swap program in favor of Superchargers, for now". www.teslarati.com. Retrieved 2018-04-18. ^ "Supercharger | Tesla". www.tesla.com. Retrieved 2018-04-18. ^ a b Udasin, Sharon (24 March 2011). "Better Place launches 1st Israeli battery-switching station". The Jerusalem Post. Retrieved 2011-03-25. ^ a b c Mark Rogowsky (2013-06-21). "Tesla 90-Second Battery Swap Tech Coming This Year". Forbes. Retrieved 2013-06-22. ^ "Better Place, California Battery Switch Station Deployment". Archived from the original on 2010-12-05. ^ "Better Place, battery switch station description". Archived from the original on 2012-08-14. ^ "Better Place's Renault Fluence EV to sell for under $20,000". ^ "Better Place. The Renault Fluence ZE". Better Place. 2010-10-22. Archived from the original on 2010-09-12. Retrieved 2010-10-22. ^ "Charging Ahead With a New Electric Car". ^ Jim Motavalli (2011-07-29). "Plug-and-Play Batteries: Trying Out a Quick-Swap Station for E.V.'s". The New York Times. Retrieved 2013-06-23. ^ Globes (2013-04-04). "Better Place sales improve in first quarter". Globes. Archived from the original on 2013-05-03. Retrieved 2013-04-21. ^ "Better Place Delivers For Demanding Amsterdam Taxi Drivers". Better Place. Archived from the original on 2012-12-07. Retrieved 2012-12-19. ^ De Danske Bilimportører (November 2012). "Statistik – Personbiler: 2011- Hele Hele året/januar-november 2012" [Statistics – Passenger cars: 2011- All year/January–November 2012] (in Danish). Bilimp. Archived from the original on 2012-12-09. Retrieved 2013-01-19. Select year and click on Pr. model for details of sales by brand and model. ^ Isabel Kershner (2013-05-26). "Israeli Venture Meant to Serve Electric Cars Is Ending Its Run". The New York Times. Retrieved 2013-05-27. ^ Niv Elis (2013-05-26). "Death of Better Place: Electric car co. to dissolve". The Jerusalem Post. Retrieved 2013-05-30. ^ Dubi Ben-Gedalyahu (2013-05-26). "Better Place CEO: A missed opportunity". Globes. Archived from the original on 2013-06-09. Retrieved 2013-05-28. ^ "Tesla Motors demonstrates battery swap in the Model S". Green Car Congress. 2013-06-21. Retrieved 2013-06-22. ^ Sorokanich, Robert (2015-06-10). "Musk: Tesla "unlikely" to pursue battery swapping stations". Road & Track. Retrieved 2015-10-26. ^ "Electric-Car Battery Swapping, Slovakian Style (Well, Vans, Anyway)". Green Car Reports. Retrieved 2017-04-25. ^ "Tesla battery swap a dead end". 2013-06-21. Retrieved 2014-02-12. ^ "Tesla Motors Introduces Mobile App for Model S Sedan". 2013-02-06. ^ "SAE Ground Vehicle Standards Status of work – PHEV +" (PDF). SAE International. January 2010. pp. 1–7. Retrieved 2010-09-03. ^ "SolarCity Installs Electric Car Chargers Along Cal Highway". Retrieved 16 July 2015. ^ "Sanya Skypump: World's first wind-fueled EV charging station – Digital Trends". Digital Trends. 14 August 2012. Retrieved 16 July 2015. 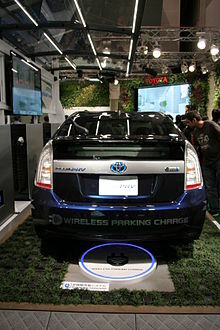 Wikimedia Commons has media related to Electric vehicle charging stations.